When it comes to cat ownership, pests like fleas are something you are likely going to have to deal with at least once or twice – even if your feline friend stays strictly indoors! Unfortunately, fleas are notoriously sneaky and can enter your home through windows and by hitchhiking on other animals and anyone who enters your home (yes, even you!). Fleas just aren’t annoying, they’re dangerous. If left untreated, your cat could develop a life-threatening infection or anemia. Fortunately, there are a variety of successful treatments available, many of which you can purchase online without a visit to a veterinarian’s office. Here are our choices for the best topical flea treatments for cats, there are several to choose from and all of the following are high-rated and work well. Perhaps one of the most well-known brands of topical flea treatments for cats is Bayer Advantage II. 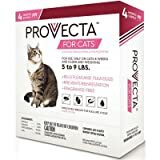 This treatment is available in different dosages (Between 2 lbs and over 9 lbs), so you should have no trouble finding one to suit your cat’s age and weight. It’s easy to apply and doesn’t contain any fragrances that could be irritating to your cat’s skin. It is waterproof after 24 hours, so you don’t need to worry about it washing off if your cat happens to get wet during treatment. Unlike some topical flea treatments, Advantage II works before the fleas bite your cat so it begins working sooner. It begins to work in less than 12 hours and is effective for 30 days. Cheristin for Cats is a topical treatment recommended for cats and kittens that are 8 weeks of age or older and weigh at least 1.8 lbs. Unlike other flea treatments, there aren’t different dosages for weight ranges. 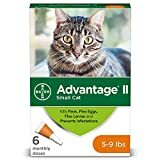 This helps keep treatment simple, especially if you don’t have access to a scale to get an accurate weight for your cat. It comes with 6 monthly dosages, perfect if you have multiple cats to treat or a particularly tricky infestation on your hands. It begins to work in as little as 30 minutes, so it shouldn’t take too long for your cat to get some relief. As mentioned, it is a monthly treatment, so it only needs to be applied once unless the infestation continues after the first month. The low price-tag. Compared to other topical flea treatments, CrossBlock II is priced the lowest while remaining effective at removing fleas. It’s easy to apply. Some happy customers have even reported that their cats were easier to manage when treating with CrossBlock II. It’s another quick treatment that promises to work in as little as 2 hours. It doesn’t have a noticeable odor, so it’s less off-putting to most of our feline friends. Unlike other treatments that only work against fleas, Provecta Advanced is effective against fleas, flea eggs, and mosquitos. It is another long-lasting option that works well while being easy on the wallet. Each pack comes with 4 dosages, perfect for treating multiple cats or having a supply on hand to use as needed. Most customers report that they haven’t noticed any side-effects on their cat after using this product. It’s fragrance-free, so you don’t need to worry about potential irritation from harsh perfumes. It’s easy to apply, making it ideal for cats who tend to be difficult to treat with flea medication. Fast acting. kills fleas in 6 hours. Fleas do not have to bite. Vectra for Cats & Kittens is a great topical flea treatment for our feline friends that are 8 weeks or older. Like many options, it is available in different dosages to accommodate variations in weight. It is proven effective against adult fleas, eggs, larvae, and pupae. You can be sure that it will help get rid of any flea infestation. Its patented applicator makes it a breeze to apply on most cats. It’s fast acting, working in 6 hours or less. It dries quickly and doesn’t leave any greasy residue that could bother your cat. Questions about Topical Flea Treatments for Cats? Still have some questions or think you’re wondering about? Here are some answers to common questions about cats and fleas. If you’re unsure about anything, you should speak to your vet about treatment options. No. Fleas don’t live on humans, so you don’t need to worry about getting them from your cat. However, fleas are known to bite humans. Flea bites are incredibly itchy and there might be some soreness around the site of the bite. Fleas are only a few millimeters long, so they aren’t the easiest to spot. They have brown/reddish-brown bodies and can jump up to 30 cm high, so they have no trouble jumping from surfaces onto your cat. Flea bites look like small red dots that usually appear in a line. Are there oral treatments to get rid of fleas for cats? Yes, there are some oral treatments available to get rid of fleas. Comfortis is a popular oral treatment for treating flea infestations in cats, but it is prescription only and should only be used on cats 14 weeks and older. Oral treatments are incredibly effective, and a great choice for cats that are bothered by topical treatments due to sensitive skin. How long does it take to get rid of fleas on cats? As flea eggs can easily roll onto the floor and hatch all over your house, the length of time it takes to treat an infestation depends on the severity of the infestation. After a few weeks of thorough cleaning and treatment, you should have a good handle on the infestation. In severe cases, it can take a few months to fully eradicate the infestation. Fleas are a fact of life when you’re a cat lover but that doesn’t mean your cat needs to suffer. When caught in the early stages of the infestation, fleas are easy to get rid of and you don’t need to give them a second thought. That said, in severe cases, you may need to enlist the help of an exterminator to safely get rid of fleas inside of your home. Additionally, you may need to talk to your pet’s veterinarian about preventative medication to ensure that flea infestations remain a thing of the past.